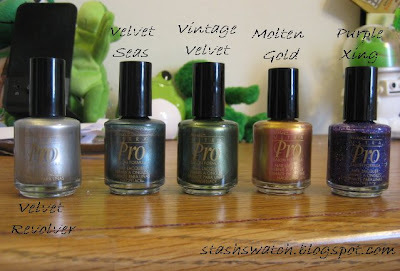 I've pretty much been changing my polish every day lately (I have the time and about a million untrieds..so why not?) Anyways, I'll start with the easier ones. This ancient China Glaze is Tropical Ice. It's probably the only pink I own that I actually really really like the color of. It's a really beautiful warm pink that I wish I had a matching lip color for. Too bad the formula is a PITA. I tried 4 coats to smooth this out and it didn't really smooth out super well (It's opaque in 3, just oddly streaky for me) Out the Door topcoat smoothed it out really well though. The bottle that I have is in China Glaze's old formulation so maybe that has something to do with it? 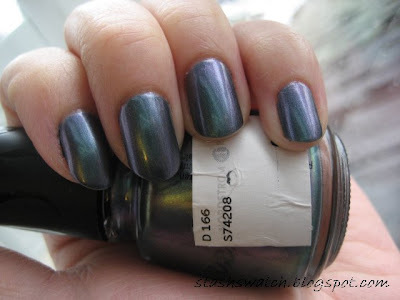 The color's discontinued, but Victoria Nail Supply still has this for sale so I figured I'd post the pic since I couldn't find a swatch of this anywhere else. Next up is Icing Mint 2 Be. I'm not sure why, but I'm really obsessed with mint green polishes. There was no sun this day or the next day, so the picture is taken in cool natural lighting. 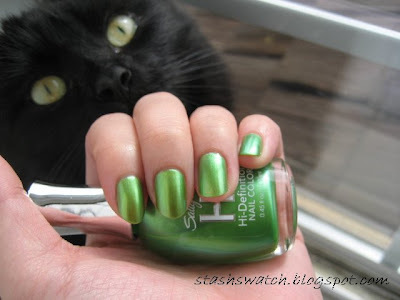 In reality, this polish is greener than depicted below and contains no blue tones as this picture might suggest. This is my standard 3 coats, though it's opaque and smooth in 2. This was my first mani with Icing's polish and I'm definitely happy with the color and formulation. 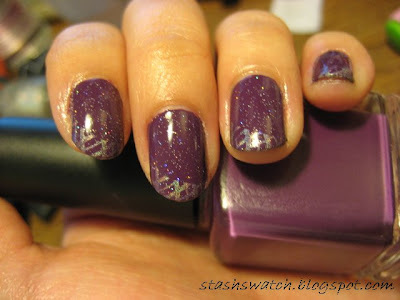 From the Alice in Wonderland collection we have OPI Thanks so Muchness! is a nice, shimmery red. I'm not sure why I didn't manage to take a picture of this in natural lighting, but here it is. I didn't find this a particularly special color, but the sun also didn't come out this day so maybe it's much prettier in sunlight. This is 3 coats, again. The polish is fairly opaque in 1 coat, but the color lacks depth and is kind of flat. 2 coats gives a much richer color, and 3 coats is the same as 2 coats, so doing 3 coats was just due to my own preference. I chipped it on the other hand building a TV stand, so I decided to change it. Now we've come to the duochromes. I got this baby (Savina Black Pearl) at Nordstrom Rack for $3.97, and it's pretty much the most amazing duochromes I own (though I think a more accurate description of this would be multichrome as it changes to multiple colors depending on how the light hits it) I did 3 coats again. 2 was fine, but I felt like 3 increased the complexity of the color. Here it is in cool, natural lighting. Here it looks blue-grey with a hint of purple and green. Wasn't that cool? I probably should have used a shinier top coat, but I still find the color pretty amazing. I've been wrestling with the thought of picking up a backup. Indoor lighting...here it is at a slightly peachy pink. It can get pinker than this, but it was hard to capture on my camera. It can also go very gold colored, though I think it's closer to an orange here. Anyways, that's all for now. I'll try not to be so lazy and swatch you guys some makeup soon, but I lack any sort of motivation to play with makeup lately, as well as the general lack of sun here lately, so we'll see. I'm going to go in reverse order. Here's what I have on right now; OPI Brand New Skates. This has been in my untrieds since my nail polish stash numbered at like 15 polishes. 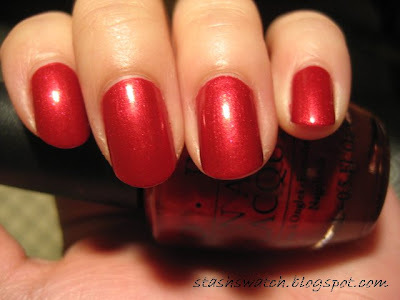 (basically since this holiday collection was released) I had a mini of this and since mini OPIs are harder to use than the full sized ones, I went ahead and bought a full size of this on Monday. I love gray np so it wasn't a huge dive for me. Anyways, this is actually day 3. I'm testing out a new base coat and so far, so good. I have very minimal tip wear on only 3 fingers..and I am VERY tough on my hands. The formula of this is definitely on the sheer side. This is 4 thin coats, though 3 was decently opaque as well. Brand new skates is a gunmetal gray with what I'd like to think of as gold microflakies. In dim lighting the gold doesn't show up much, but once the sun hits it, the gold shines beautifully. It's definitely a really pretty color. Next up we have Misa Sorry Just Can't Help it. For some reason every picture I took in natural lighting came out really blue. It really doesn't look like this at all. It's a warm purple cream that's opaque in 2 thin coats (If you prefer doing thick coats, you can probably get this in 1) I did 3 coats out of habit though. I konaded over it, and this picture is taken in really warm lighting but this picture is more accurate, though the actual color is just a touch cooler than this. This is China Glaze OMG konaded over Misa Sorry Just Can't Help It, with Out the Door Nothern Lights Silver Holographic top coat over it. Lastly I have Sally Hansen Hi-Def. Hi-def is a great lime green that just glows like it's lit from within. (must be the liquid crystals). There's 3 pics of this just for fun, and to show how well it brings out the green in Zero's eyes. 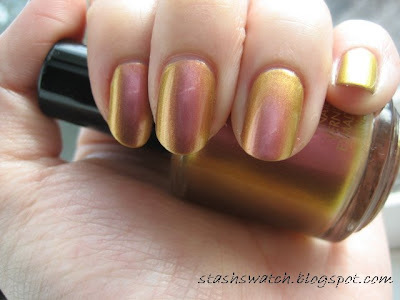 This polish is definitely on the sheer side. This was also 3 coats. Anyways, that's all for now. Hopefully the sun will come out again soon and I can get a real post in for you guys. Nina Ultra Pros are currently on sale at Sally's for $3.29 so I picked up a few of the new ones. Since I'm in the middle of taking stash pics, I have bottle pics for you guys. The new Nina Velvets are actually really nice, so I definitely recommend them. It also helps that they're thick enough to use for Konading (Velvet Revolver is at any rate). Here's another pic, just in natural lighting since the my camera seems to not like the amount of glare coming off the nails/bottle. I'd describe this color as a metallic, somewhat dusty Jade green. My camera didn't capture the color exactly.. it's darker in the pic up top and bluer in the bottom pic. Musicalhouses from Of Faces and Fingers was kind enough to name me for an award. (Thank you!) 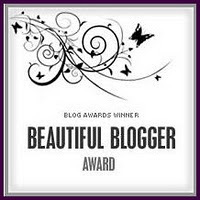 Apparently the award comes with a couple of rules; that you have to write 7 things about yourself and tag 7 more blogs..so here goes. 1. Except for my stash of makeup and polish, I'm a pretty big tomboy. 2. I'm addicted to color, but you'd never figure this looking at my face and clothes...my previous obsession before makeup and polish was art supplies...all of which go untouched now. 3. Video games>>makeup. I will forego buying makeup I want if there's a game I really want, though I keep up with makeup collections more than game releases, so it's a rare occasion. 4. I lack the hand-eye coordination usually required for gaming...oops. 5. I'm more of a dog person than a cat person..I actually disliked cats for the longest period of time. 7. Martial arts are the only "sport" I enjoy. 5. 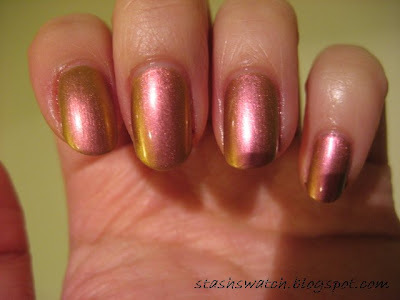 The Swatchoholic - her nails are gorgeous and very creative! 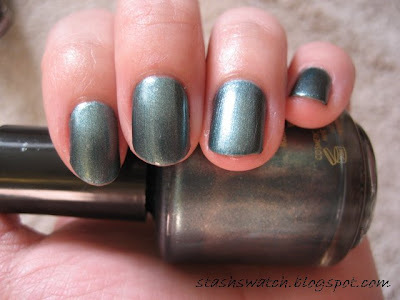 It's been really overcast here so there's been no sun, but here are a couple pics of OPI No Room for the Blues. It's a bit more cool toned and vibrant in real life, but all I had available light-wise was my desk lamp. Unfortunately I seem to have missed a spot during cleanup.